South African style has simplicity, modern decor and sophistication that make it so special, attractive and full of life. 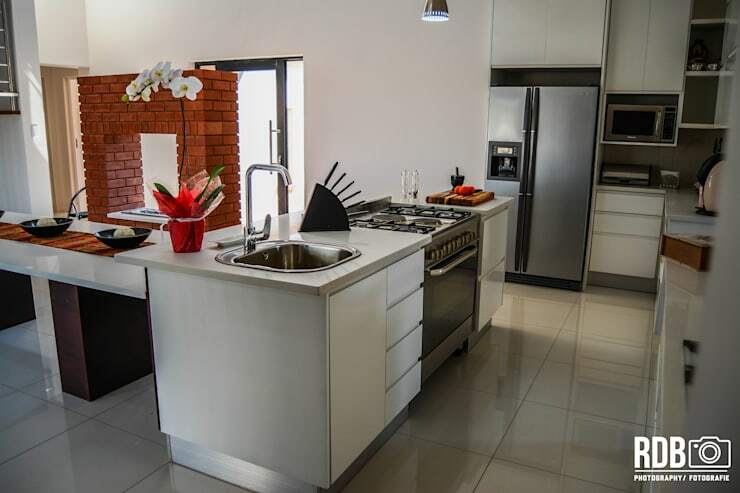 Entertaining family and friends is important for South Africans and the kitchens are therefore spacious pleasant and welcoming and cosy. The 3 kitchens that we are about to visit on our virtual tour meet all the requirements for the modern family that value social interaction, good food and fantastic company. 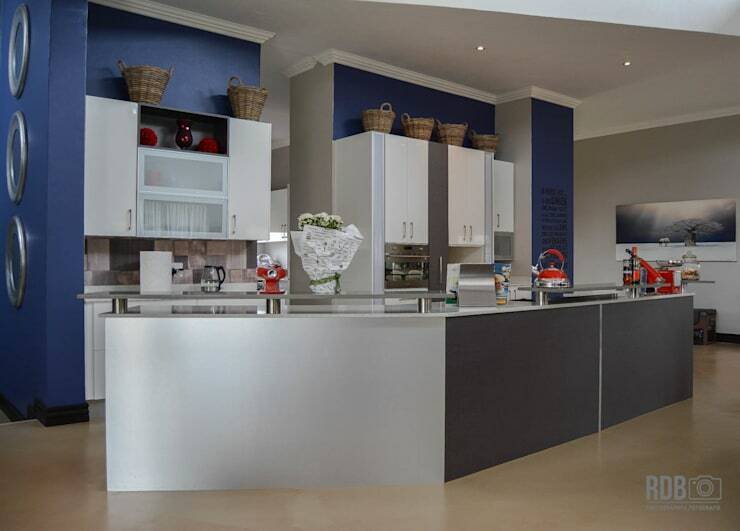 This kitchen has mastered perfect storage, comfortable layout and simple colours in all respects. The natural lighting adds a comfortable touch that makes this kitchen cosy and welcoming, while also allowing fresh air to enter the space. The raised counter means that there is enough space to whip up a gourmet meal on the counter top without your guests catching a glimpse of your secret family recipe. The materials used for the counter are high quality, elegant and sophisticated, making this kitchen trendy for years to come. 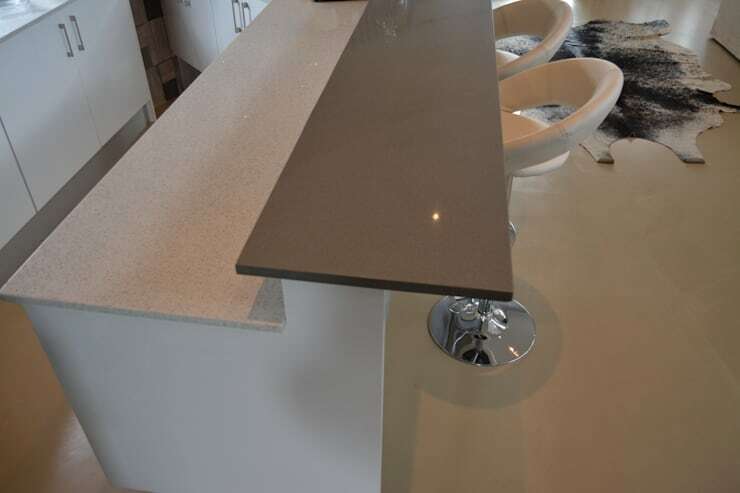 The raised counter also serves as a breakfast bar and informal seating area, a must have for those quick meals! No need to set the table with linen and fancy ornaments, just grab a bite and have a seat. 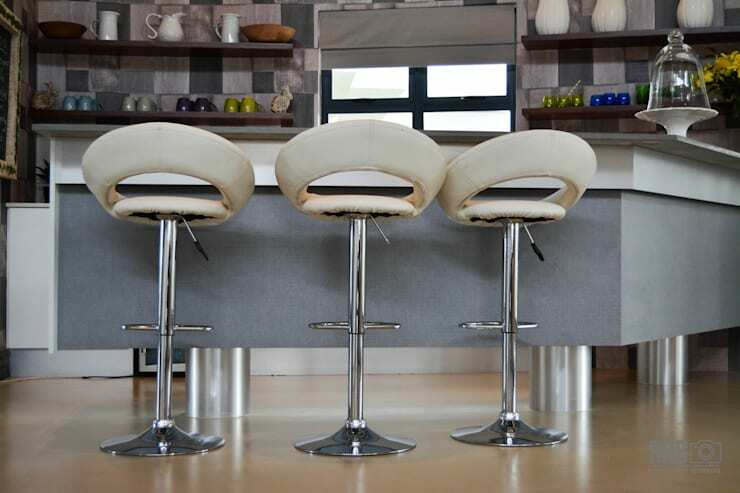 The bar stools are comfortable and height adjustable. A kitchen such as this would be a feature in any home. It's attractive, spacious, modern and inviting. The never-ending countertops means that cooking a meal for a large family is a breeze. No more being cramped into the corner. A modern kitchen would not be complete without built-in appliances such as this. 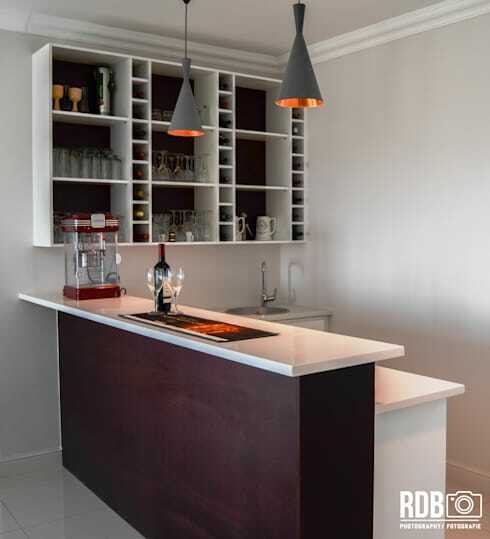 It shows that the interior designers of this gourmet cooking dream took perfect planning into consideration. The eye-level oven is a good choice too, especially for families that have smaller children. Although this kitchen is undeniably modern in its style and space, that doesn't mean that a personal touch has been neglected. The rustic backsplash is a great choice for the kitchen, as it adds some colourful country character. Simple and stylish in every way! This is a modern kitchen in all aspects of design, from the minimalist cabinet doors that do not have handles, to the neutral decor. The design is perfect for a professional couple that work together daily to prepare meals. The gas stove is necessary to ensure meal cooking time is efficient and effective. The bar area is a must-have for any couple who enjoy entertaining friends and family on weekends. Create your own cocktails and signature drinks, while enjoying the company of loved ones. 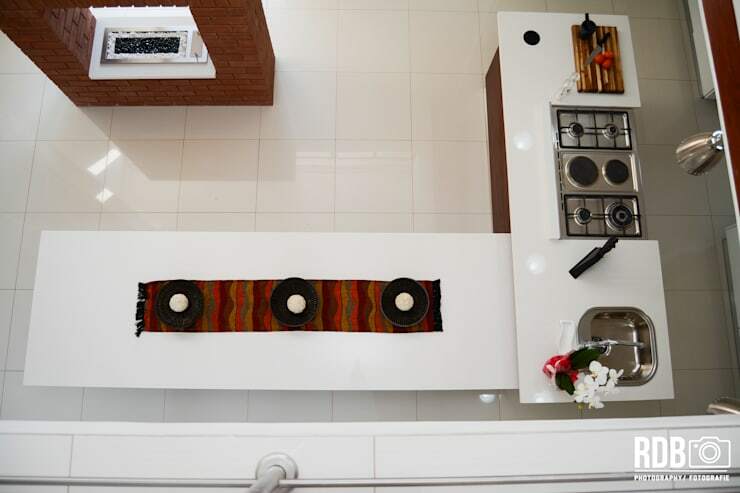 This aerial view shows the layout and structure of the modern kitchen. 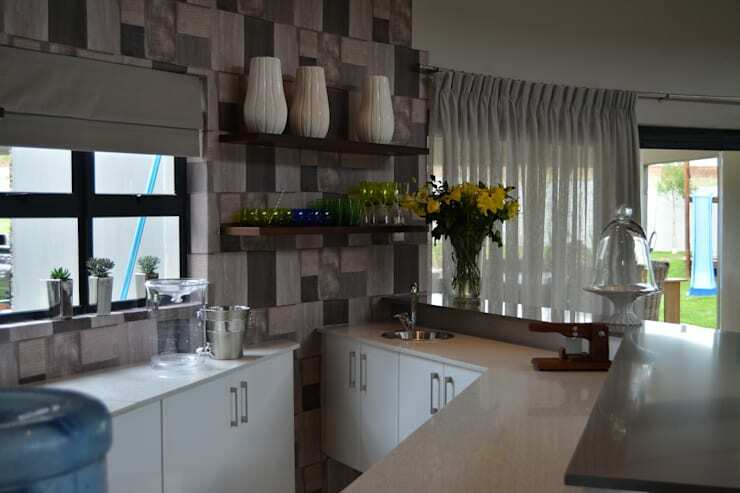 The eating area, as well as cooperation in the open plan living space means this kitchen is comfortable and elegant, and with the inclusion of neutral colours in the decor, the kitchen will remain tasteful and trendy for years to come. If it's architecture inspiration you're in need of, here are: 8 Majestic Houses That Are Proudly South African. Which is your favourite South African kitchen?